As part of the Tory offensive against the public sector the chancellor has announced a 20% reduction in DWP offices and more job centres to share sites in local authority premises to deliver 30% saving on estates costs. This fits in with the approaching end of the contract with the company which owns the DWP estate. At the beginning of December 2016, there was an announcement of the closure of half the jobcentres in Glasgow. 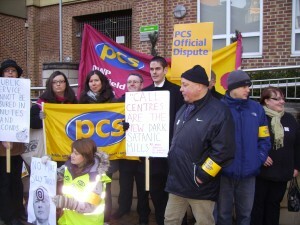 This was met by immediate anger and opposition from PCS members, politicians and claimant support organisations. The campaign has continuously been in the news from day one and has rocked the ferocity of the opposition has rocked the government. This stopped DWP in its tracks until 26 January when the announcement was made about the future of over 700 offices in DWP. Behind the headlines of the closure of 78 job centres, which will damage the ability of the public to access our services, there is also a huge list of office closures. But there is a wider attack on jobs in some of the most deprived communities. For example over a 1,000 jobs are being proposed to move out of the South Wales Valleys into two sites in Cardiff. We see proposals like this up and down the country in communities which desperately need jobs. All of these cuts are only proposals. We have seven weeks to involve everyone in our communities in campaigning to defeat these proposals. 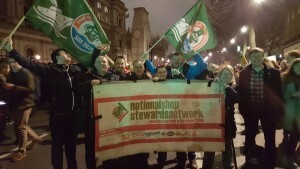 We had a great start in Glasgow and our members and reps are up for the fight. We appeal to fellow trade unionists and community groups to get stuck in alongside us. Politicians who have seen the campaigning work in Glasgow are also lining up to support us.